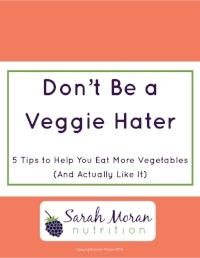 Get my FREE guide to eat more veggies and actually like it! By signing up here, you'll also get my free newsletter with my latest videos and updates. Don't worry. We'll never sell your information or spam you. To complete the sign-up process and get the free guide, please click the link in the email I just sent you.